« Go! Enjoy the Manitoba Fall (whilst it lasts). That is lovely – I would NEVER have that kind of determination. .-= Clinically Clueless´s last blog .."Proud Mary" – Gay Men’s Chorus of Los Angeles =-. haha – my lady-friend loves those Simon’s Cat cartoons. Cheers for reminding. Yes, I recently just found Simon’s Cat cartoons. I glad that this helped you to remember. I really enjoy them. 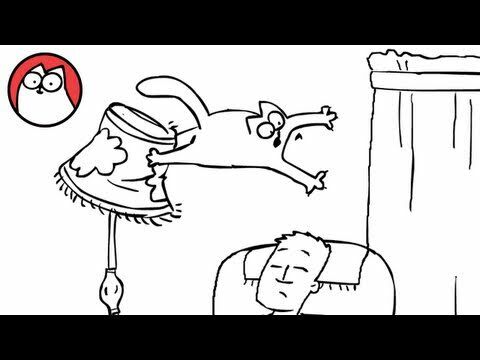 0:59 is so funny when the cat peeks over the back of the chair. With 5 kids running around on a regular basis (when I have my two to stay) but not regular enough!! – whats 4 cats into the mix? They sleep, they eat, they sleep some more, they catch at least 4 mice/rats/birds/voles/worms a day between them and then scowl and scratch you when you try to put them out for the night (or hide under a bed and want letting out at 4.30am). So no problems there then – absolutely fine… nothing sleep won’t fix…. (nervous fiddling)…(panic stricken looking around room for signs of cat)…. .-= Purple13´s last blog ..Personalised Baby Photo Albums – New =-. LOL!! What a mix..panic stricken just thinking about it. I’m sure that you do a good job, but sheeh!! Reminds me of my Hannah. I am smiling. .-= Theresa111´s last blog ..Celebration For October Birthday People =-.